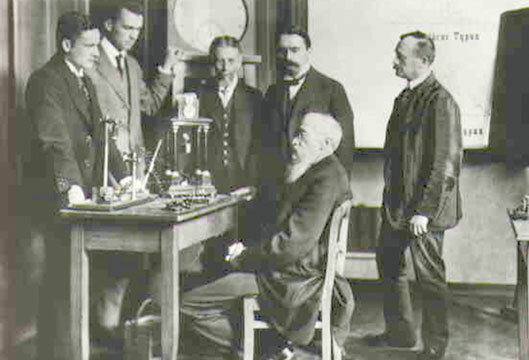 Fechner’s attempt to place psychology on the firm foundations of experimental science was undertaken in a sceptical intellectual atmosphere still philosophically dominated by post-Kantian thought. The challenges facing Fechner included not merely the persistent issue of mind–body relations but comparably fundamental questions in philosophy of science, the nature of measurement and the essential character of theory and explanation in science. Despite these hurdles, he succeeded in outlining a ‘biophysics of mental life’ that many see as the foundation of experimental psychology. a name in a book, and his psychophysics little more than a chapter in introductory treatments of ‘sensation and perception’. He is credited with discovering a law, though its application is restricted and in some instances (e.g. loudness) defective. But books, and especially textbooks, have a way of draining the colour from lives, overlooking the passion and the personality behind every scientific and intellectual achievement. Conventional accounts of Fechner are no exception. Yet Fechner was, indeed, exceptional. His defence of the perspective and the very methods of psychophysics would stand as nothing less than a defence of psychology’s membership in the community of science. the philosophical road itself had taken a twisting path away from the introspectionism of the empiricists. What they lacked – what philosophy could not supply – were experimental modes of inquiry and a commitment to measurement; a commitment to methods designed to yield systematic relationships between experience and its objects. Trained and original as an experimental physicist, Fechner was at home with the leading scientific thinking of the age. He knew that the two ingredients essential to any scientific undertaking were a methodology and a sound system of measurement. Psychology had neither. Fechner also understood the importance of theoretical modesty in developing a science. The right mode of inquiry begins with facts and moves cautiously toward theory. The clearest fact for any inquiry pertaining to mental life is the relationship between the stimulation of sense organs and the sensations that attend it. How is this relationship to be understood? Fechner recognised the historical attention that had been paid to this question. He seeks to dispose of it in the very first chapter of his book, under the heading, ‘Considerations on the relation of body and mind’. As a necessary first step in science, one must not surrender the entire enterprise to philosophy. The mind–body problem as framed by Fechner is to be recast in technical and perspectival terms rather than those of metaphysics. Technically, one has direct, unmediated access to one’s experiences, whereas access to any material entity is mediated. The material side of life, he says, is hidden by the mental. Philosophers, instead of proceeding to devise the means by which to reveal what is thus hidden, develop competing theories. Fechner chooses Leibniz to illustrate the point. As bodily and mental events occur together, one may explain the connection with the metaphor of a pair of clocks. The clocks might be tethered to the same board and thereby have their movements causally linked. Or there might be someone who intervenes and personally moves the hands of both synchronously (‘Occasonalism’). Then again the clocks may be expressing an original design, unique to each, such that they function independently but in perfectly parallel fashion (‘Pre-established Harmony’). But suppose, Fechner says, what has been left out of such accounts is, ‘one point of view – the most simple possible. They can keep time harmoniously because…they are not really two different clocks’ (Fechner, 1860/1966, p.4: all quotes taken from 1966 translation). What differs is the perspective, not the reality. If one chooses, one can confine one’s observations to the relationship between stimulation and its effects on nerves and brain, thereby developing an inner psychophysics. Alternatively, the focus can be on the relationship between stimulation and experience, yielding outer psychophysics. As Fechner notes, with a frozen brain one gets neither! Fechner is at pains to note that human beings, if regarded as clocks, are recognised as not merely clocks. His point, of course, is that the reductive strategies essential to scientific explanation should not be understood as exhausting either the meaningfulness or the wider nature of the entities so analysed. It is clear, for example, that Fechner accepts the ordinary understanding of free will. He points to the obvious fact that persons can walk from here to there, on journeys long or short. But it is also the case that their actual movements are subject to the laws of mechanics, to the conservationist principles so recently established by Helmholtz, to the constraints imposed by weakness or illness, etc. It is the project of science to identify the physical and material conditions and constraints, understanding that philosophical modes of inquiry would never be sufficient. Fechner gives great praise to J.F. Herbart, Kant’s successor at Königsberg. In the matter of psychophysical measurement, Fechner says that Herbart ‘had this measure practically within his grasp…’ (Fechner, 1860/1966, p.46) Herbart had defended the project for scientific though not an experimental psychology. He was perhaps the first to use the term ‘threshold’ in the sense it would come to have in psychology. Though Fechner picks up the account with Herbart, it was actually Kant who laid the foundations in that section of the Critique referred to as the ‘Anticipations of Perception’. It is here that Kant discusses the a priori basis on which to determine just what belongs to empirical knowledge; i.e. the property in principle that renders anything a possible object of perception. What Kant established metaphysically, and what Herbart proceeded to develop in a strictly mathematical way, is what finally would arise in the experimental work of Weber and in the law that bears his name. The absolute and difference thresholds, and the relative constancy of Weber’s ratio, were key ingredients as Fechner approached the problem of measurement. Weber had shown that quantitative techniques could, indeed, be profitably applied in attempts to measure at least one aspect of the mental. Choose a standard stimulus (e.g. a weight). By how much must a comparison weight differ from the standard to be perceived as just noticeably different? What Weber discovered was that, at the point at which two stimuli are just noticeably different, the ratio of the difference between the standard and the comparison stimuli to the magnitude of the standard is constant. So blindfold a person and give them a 1kg weight, and an increase of a few grams will not be noticed. If the mass is doubled, the threshold called ‘smallest noticeable difference’ also doubles. a law of discrimination and Fechner sought a law of sensation itself. Enter Herbart (in the shadow of, alas, Kant). By regarding a given magnitude of sensation as the outcome of an indefinitely large number of indefinitely small difference thresholds, Fechner reasoned that the mathematical integration of the series was the right model for that ‘inner psychophysical’ process from which sensations arise. The result of this mathematical operation was R = k log S, Fechner’s law. It is instructive to rehearse briefly the ingredients so skillfully assembled here. First, a trenchant defence of monism. Reality is given in two aspects – the psychic and the physical – but the science of psychophysics provides the means by which to reveal their lawful relationship. By adopting this double-aspect perspective, Fechner removes one chief obstacle to experimental approaches to mind and mental life. His use of mathematics was pivotal in the development of his programme. The credit he pays to Euler, Bernoulli, Laplace and Poisson is revealing. Euler had made original contributions to the mathematical modelling of pitch. Fechner cites the probability theorists for their distinction between fortune morale and fortune physique in games of chance, finding in such work developed precedents for constructing mathematical models of complex human activities (see also Newman, 2000, pp.1155–1157). Then, with success to this point, he must offer a guarded argument to the effect that ever more complex cognitive processes should lend themselves to comparable models and modes of measurement. In the ‘hard science–soft science’ dichotomy, candour requires psychologists to locate most of what passes under the aegis of the discipline as ‘soft’. This is not condemnatory but descriptive, and descriptive in a way that raises fundamental questions regarding the discipline’s proper subject matter and (therefore) proper modes of inquiry. Psychophysics in this matter stands as something of the gold standard, for it is the one specialty in which functional laws are numerous, reliable, basic and cross-disciplinary. Energy at the visual threshold psychophysically established can be matched with findings at the level of electrophysiology and pigment chemistry. Research in sensory information processing, in which psychophysical methods are routine, have provided bridges to engineering, computer modelling, theories of higher levels of mental function. At its most productive, cognitive neuroscience is psychophysical in precisely the way envisaged by Fechner himself. Perhaps it would be too generous to credit Fechner or his book with a full-fledged anticipation of all this. Yet, if he did not see all of what was in store, he might have seen some possibilities still to be redeemed. When he first turns to the ‘The Principle of Psychophysical Measurement’, attention is drawn not to human subjects in small dark rooms, but to some 15 pages devoted to kinetic energy and the conservation laws (Fechner, 1860/1966, pp.19–37). Clearly envisaged in these pages is a biophysics of mental life; a psychological science that is broadly ecological and ultimately prepared to study the dynamics of psychological processes within the context of physics proper. Thus might psychology have ‘an establishment of its own’. Cahan, D. (Ed.) (1995). Science and culture: Popular and philosophical essays. Chicago: University of Chicago Press. Newman, J.R. (2000). The world of mathematics: Vol. II. New York: Dover Publications.